St. John Baptist Church in Columbia recently installed a powerful memorial to victims of gun violence in the greater Washington, DC, area. On an embankment behind the church are simple frames, and on each frame is the name (if known), age, and date of death of those killed with a gun in 2014. The resulting display is striking. Panoramic view of the display memorializing victims of gun violence in the greater Washington, DC area in 2014. Click on image for a larger view. As Columbia, Maryland is a suburb of Baltimore, presumably the memorial includes Baltimore, Washington, DC, and the area in between. But no matter how you define it, the field of T-shirts is quite moving. The range of ages, from the very young to the very old, is also sobering. 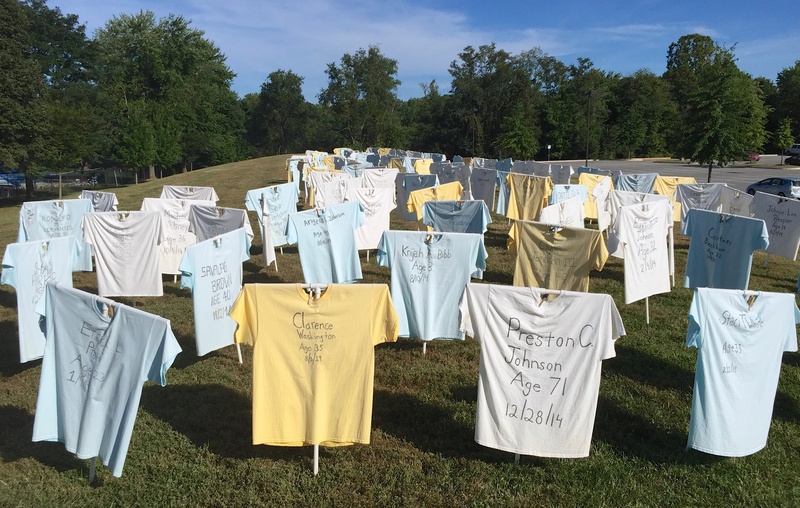 The stark simplicity of the memorial is stilling: these are shirts that will not be filled, and in many cases the shirts are for victims many times too young to wear an adult T-shirt. My thanks to the St. John Baptist Church for taking the time and effort to remind us of what we have lost. Traveling to the nation’s capital from distant Silver Spring, Maryland, was a journey through a single timezone and a distance measured in subway stops. Along the way there were many wonders, such as this Transformer attempting to sneak toward the capital disguised as, ah, a Transformer? Transformers may have originated in Japan, but this one seems to have mastered at least a few letters of the Roman alphabet. It isn’t clear if this is a good Transformer or one of those bad ones that appear to be pawns of developers, laying waste to urban areas in order to promote redevelopment. A small orchard of bollards, an offshoot of the vast bollard forest that seems to have engulfed the capital of the United States. 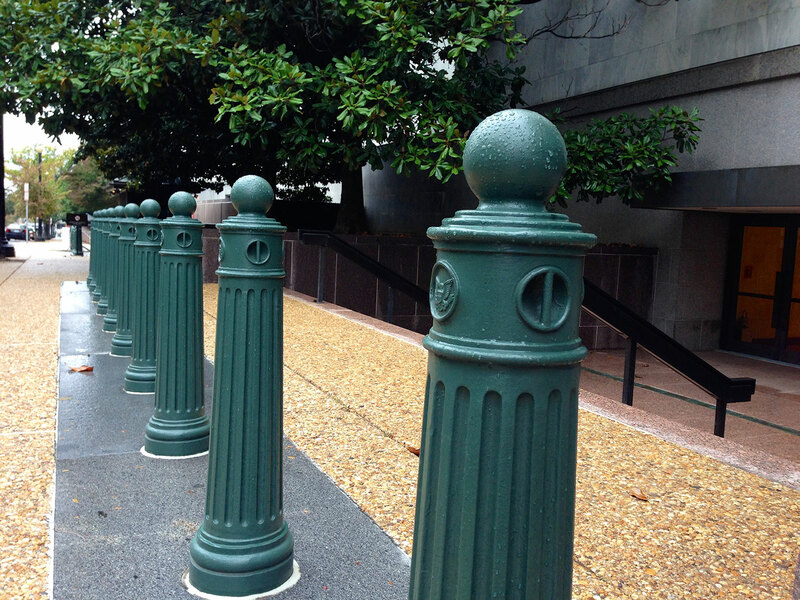 Bollards were developed to tie up ships to shore facilities, but one thing Washington does not have is an accompanying fleet of ships tied to the forest of bollards. As the bollard population is constantly growing, we can only conclude this is proof positive that global climate change is real, the oceans are rising, and the government is preparing for a massive rescue fleet. 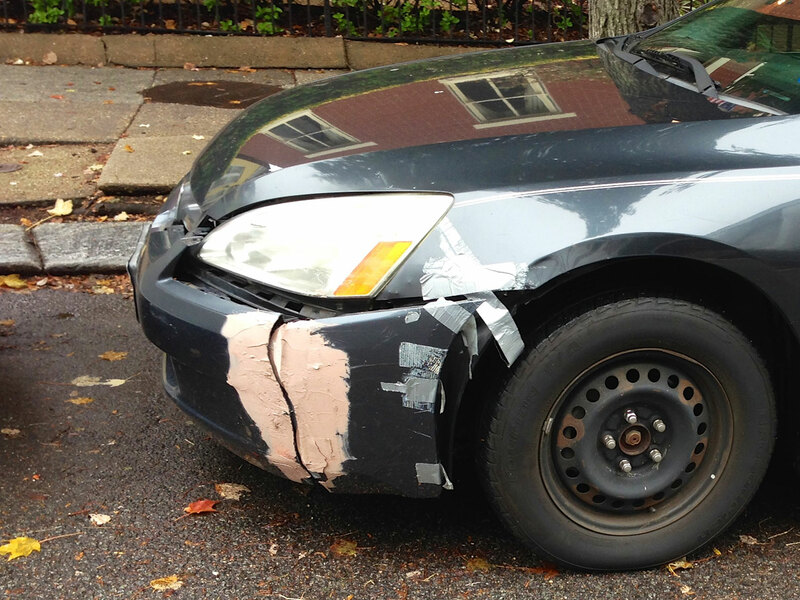 This highly customized car features the latest in capital innovations, from the oddly pink floor sealant (or ceiling spackle, or silly putty) on the split-skirted bumper to the abstract tape artwork on side panel. The rusted wheel, sans wheel cover, is a bonus. People in the capital aren’t like you or I; they’ve got custom rides! 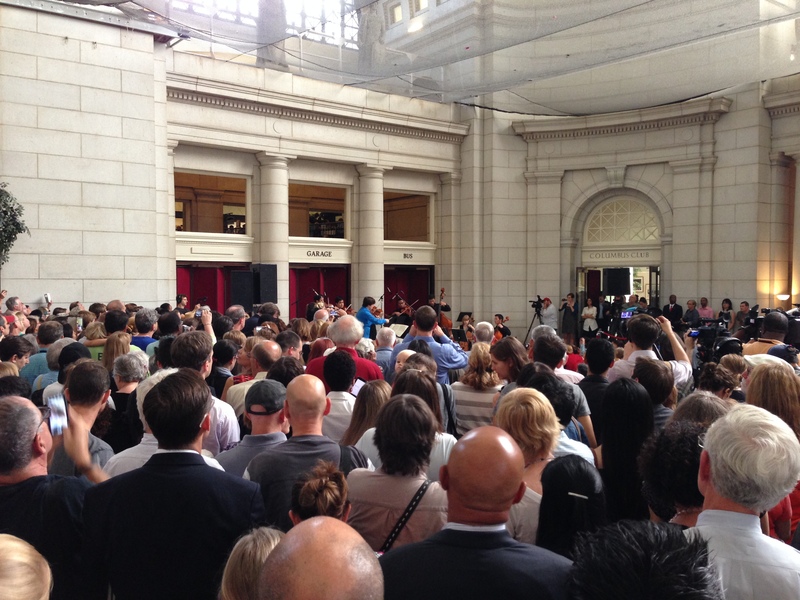 Joshua Bell returned to Washington, DC, to attempt another concert in a train station. Since it was during lunch hour, and in a train station, why not take a train to see one of the greatest violinists in the world? It was more successful than his first attempt. Joshua Bell, in a medium blue shirt under the center pillar in the distance. For the first time, the National Book Festival was held inside the air-conditioned confines of the Washington Convention Center. In recent years, the Festival was held on the National Mall, at the height of summer, in various hot and humid pavilions. The National Park Service thought that these and other events were causing too much damage to the Mall, and have asked event organizers to pick another venue. This year the National Book Festival featured an excellent set of displays by the Library of Congress, the Festival organizer, plus lots and lots of books, book signings, readers, interviews, etc. Photos from the 2014 National Book Festival. 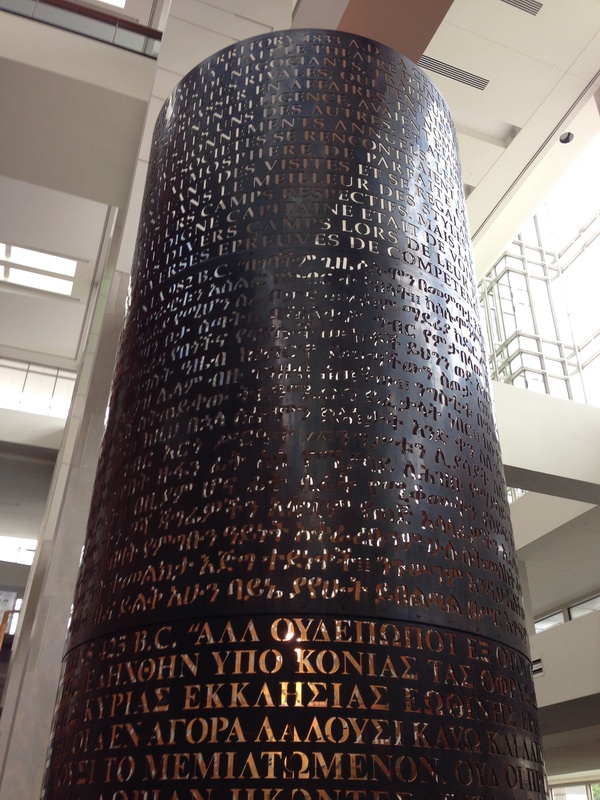 A modern version of the Rosetta Stone, hidden away in the lobby of the Washington Convention Center. 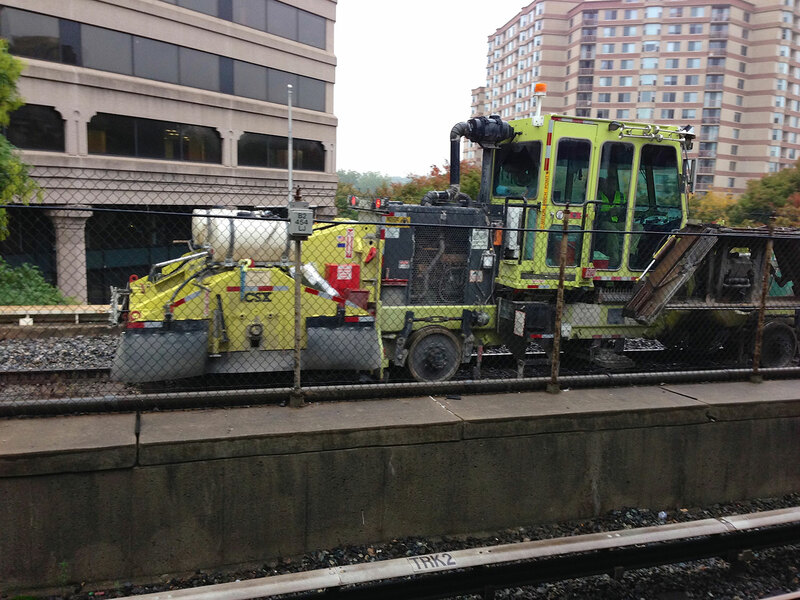 The legislative branch is undergoing some much-needed patching. To the right you can see the very tip-top of the Jefferson Building, part of the Library of Congress, behind the Capitol. Legislatives rarely go there.